IT IS A BLESSING to be able to bless. It is with this in mind that we celebrate the 125th Anniversary of The Methodist Church in Singapore (MCS) by reaching out and blessing the community in need. Though not as visible as the poor in developing countries, there are chronically poor people in Singapore. They are the bottom 10 per cent of the socio-economic ladder and subsist on an average per capita income of $350 a month. Various sources put this figure at 10,000 to 80,000 people. is means they live hand-to-mouth and do not have the resources to improve their situation. What makes them chronically poor? Their circumstances, many of which are beyond their control; minimal or no family support, low education, resulting in employment in daily-rated or contract jobs. 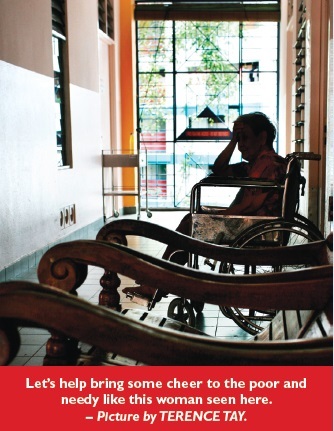 Often, adult members of their family have disabilities and/or are too ill to work, or are incarcerated. There is also a likelihood of instability as health and mental issues are often unaddressed. These factors, or a combination of them, work against them and perpetuate the cycle. While there are financial schemes to help these families, some are short-term, conditional and very often do not help them to look beyond survival needs. These families need more financial help and they need it for a longer term. While it may be possible for some families to eventually break free from chronic poverty, the process takes many years and there is no “ballpark time frame” for this. 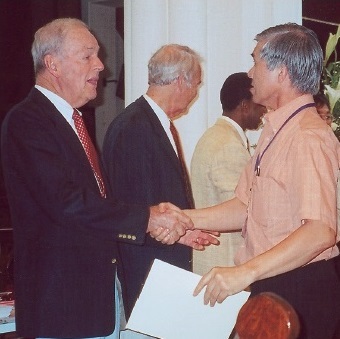 In line with the theme “Together in God’s Mission”, the MCS’ 125th Anniversary Community Outreach Project aims to galvanise the Methodist community into active service – not only to help the chronically poor with what they need most (money) but also to reach out and befriend them in the love of Christ. There are two parts to this project. First, to raise the funds to bless the chronically poor. Methodist Churches and our members are asked to reflect on the blessings that God has poured into our lives, and to prayerfully consider how much we can bless the chronically poor in return. Cell groups too may consider “adopting” a number of families. As this fund will be managed by the Methodist Welfare Services (MWS), donations will also be subject to two-and-a-half times tax deduction. The second part of the project involves making monthly visits to the homes of the chronically poor people to disburse the money to them. These can be done by pairs of individuals or again, by cell group members. 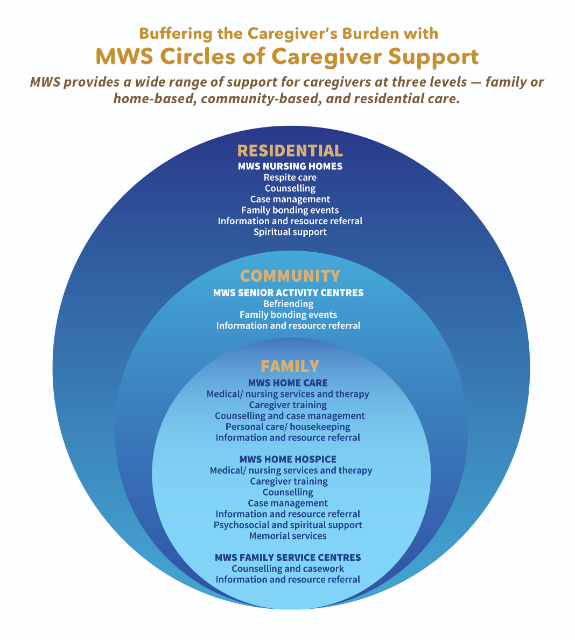 rough these 12 monthly visits, we hope that a relationship can be built with the families, and that you will be able to truly befriend them and perhaps even help with other needs. Be assured that you will not be thrown into the deep end – the MWS will hold briefings for the volunteers and provide guidelines for visitations. Where will these families come from? Family Service Centres around Singapore will be informed of the project, so chronically poor families who seek help from them can also be put on the programme, based on a set of selection criteria. Many churches may already have ministries serving needy families. If these families meet the criteria, they too can benefit from this programme. The target sum which we aim to bless the community with is $1.25 million. is will be disbursed to chronically poor families, giving them $125 per month for a period of 12 months. While $1.25 million may sound like a large sum, for this outreach project it equates to care for only 834 families. With a population of 36,000 Methodists in Singapore, we believe that this target is achievable. In the coming months, there will be posters and flyers on the MCS’ 125th anniversary activities. Do look out for details on how you can sign up for this community outreach project and be a blessing to someone in need. Mylene Koh is the Manager, Communications of the Methodist Welfare Services. THIS IS THE LOGO of the 125th Anniversary of the MCS. Plans are being finalised for a series of events to celebrate the anniversary next year, 2010, and the logo will be used in a variety of formats to highlight this milestone. The theme for the year-long 125th Anniversary celebration is “Together In God’s Mission”. The logo was picked from a total of 66 entries submitted by 36 designers in a month-long competition opened to MCS members in August 2009. It is comforting to know that the MCS is blessed with so much talent. e designers are from 12 churches from the three Annual Conferences – Barker Road Methodist Church, Wesley MC, Charis MC, Toa Payoh MC, Bukit Panjang MC, Grace MC, Paya Lebar MC, Bedok MC, Faith MC, Jurong Tamil MC, Sengkang MC and Trinity MC. Three of the entries were shortlisted before this winning entry was picked by a seven-man selection committee. e winning design is by Ms Gwendolyn Tan, a member of Barker Road Methodist Church, who will receive the top prize of $500. The designers of the other two shortlisted entries are Ms Shirley Koh of Bedok Methodist Church and Mr Abel Amir of Jurong Tamil Methodist Church. They win the consolation prizes of $200 each. All the three prize winners will be recognised at the Aldersgate and 125th Anniversary Thanksgiving Service on May 22. “TOGETHER IN GOD’S MISSION”. What’s new about this statement? 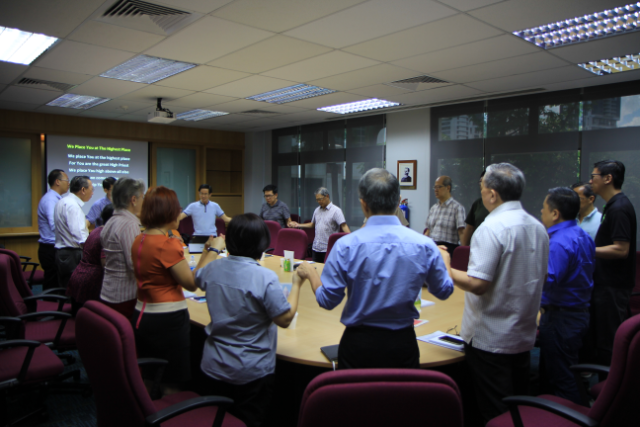 After all, members of The Methodist Church in Singapore (MCS) have been working together going about God’s business these past 125 years since the MCS was founded in February 1885. For 125 years, we have been blessed richly by God and by the earliest missionaries who came – and the others who came after them – and they had been working together in God’s mission. So now is a good time, as we celebrate this milestone, to share our blessing with the community, especially the chronically poor, and there is no better way to remind ourselves to do our bit for society than to work “Together in God’s Mission”. This, then, is our theme for the 125th Anniversary of the MCS. This celebration is not so much about ourselves having a big party, significant though the event is, as sharing our joy with the community. With that in mind, the Methodist Welfare Services (MWS), the social service arm of the MCS, has been given the task of spearheading a social outreach project to bless the community with the support of our church members and the entire Methodist community. We aim to bless the community with $1.25 million, which will be disbursed to chronically poor families, each receiving $125 a month for 12 months (full story in the main article on Page 10). 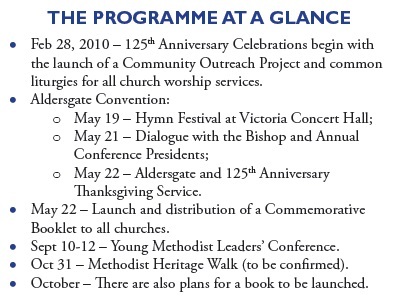 The year-long programme will include connection-wide celebrations at the local church level on Sunday, Feb 28, 2010, a special Aldersgate Convention in May, a Young Methodist Leaders’ Conference in September, and a Walk planned for October. A Commemorative Booklet will also be distributed to all churches on May 22. The Council of Presidents is preparing a set of liturgies which all churches will use as part of their worship on Feb 28 to kick-start the celebration. On that day all our 44 Methodist churches will be shown a short video presentation on the MCS and a rallying call for the entire Methodist community to spread some cheer to the poor. Aldersgate Convention 2010 will be celebrated with a Hymn Festival at Victoria Concert Hall on May 19, a Dialogue with the Bishop and the Annual Conference Presidents on May 21, and the Aldersgate and 125th Anniversary anksgiving Service on the evening of May 22. is is the first time that no foreign Wesleyan authority has been invited to speak as the Convention committee feels that the 125th Anniversary programme is an opportunity for church members to hear out our own leaders. Hence, the dialogue at which church members can seek answers on our Wesleyan tradition from the Bishop and the three Annual Conference Presidents. The Young Methodist Leaders’ Conference will be held from Sept 10 to 12. About 250 young adults are expected to attend. 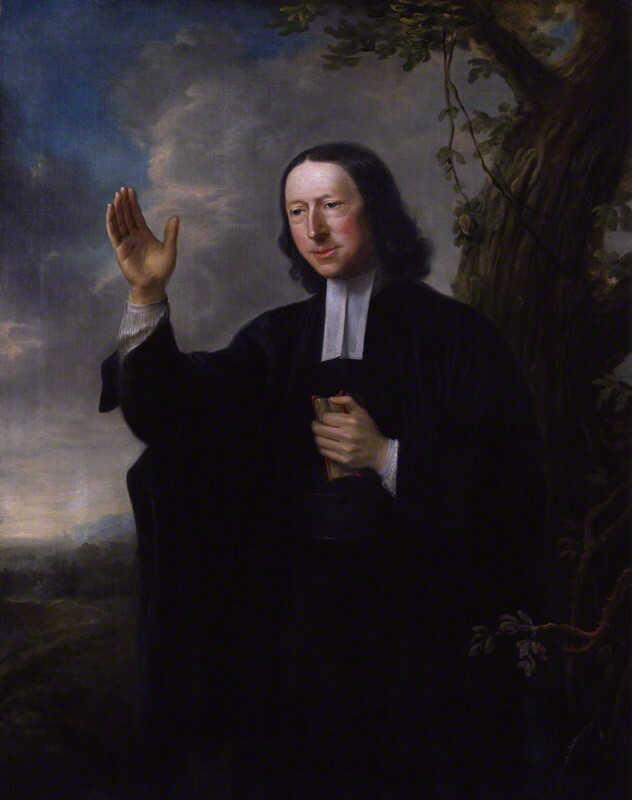 The Walk is planned with the aim of rekindling church members’ interest in our Methodist heritage. The proposed route will take in Methodist buildings and heritage sites such as Wesley Methodist Church, Tamil Methodist Church in Short Street, the former MPH at Stamford Road, the former Methodist Girls’ School and the former Trinity eological College, both in Mt Sophia. Some 3,000 Methodists are expected to take part. Aldersgate Convention 2004 is here!